By 52 to 45 percent, Americans say marijuana should be made legal, according to a poll released by the Pew Research Center. Last November, a Washington Post-ABC News poll found the public split 48 to 50 percent on whether to legalize small amounts of marijuana for personal use. 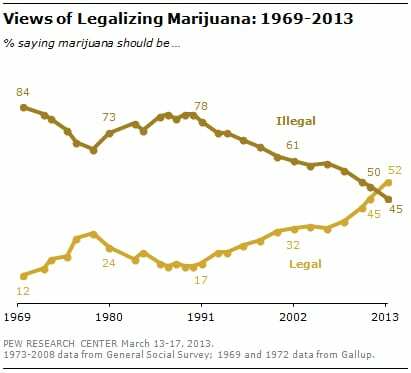 And 51 percent of registered voters supported legalization in a December Quinnipiac University poll. The rapid change matches an increase in usage – in the new poll, nearly half of Americans report trying marijuana at some point in their lifetime (48 percent), up eight points since 2010 and also a record high. Last year, laws legalizing recreational marijuana use passed in Washington State and Colorado. The federal government bans production, possession and sale of the drug. This entry was posted on April 5th 2013 at 3:50pm/15:50 and is filed under Law & Justice, Live News Column 1, Politics. You can follow any responses to this entry through the RSS 2.0 feed.